I've been trying to tune my violin using the tuning helper Mr Fiddlerman has generously provided, but I just haven't got an ear for the sounds I hope this isn't going to be a long term problem, I just can't seem to match up what I play and the sounds from the tuner. Is this something that comes in time? Thinking of picking up an electronic tuner so I can at least practice in tune, but wondering if it's a bit of a lazy way out? This is music, RossTiger. Cheat whenever you can. In that case, use the electronic tuner definitelly! Take your time to remember the "right tone". I'd recommend to use the tuner to tune your violin and then compare with Fiddlerman's tuner which produces the tone - so You'll be able to HEAR the proper sound. If You'll have time - do it several times a day. I believe that You'll be able to correct the tuning with Fiddlerman's or other tone-producing tuner very soon after that. Everything comes with practice! I thought i could never tune violin with open strings only, using just a fork for A, LOL! It comes with time and exposure. You will get your musical ear! I never needed it, since I already had tuners for years before getting a violin, and have other instruments in the house. Other folks seem to manage ok with the FM tuner, though, so I usually don't mention it. It sounds like it may be midi files, and apparently the midi idea of violin includes constant vibrato. That's just a guess, though. I also find the Fiddlerman tuner hard to use due to the vibrato, so this is what I use. I save it in my favorite place's for easy access. So you know according to my Sona Clip Tuner set to 440 all but the C string, on the Viola Tuner, are set at 5-10 cents high. C is dead on but the others are a bit off. If you just want pure tones, Pierre, they're easy to get (even for a 443 tuning). The waveform of a violin is approximately a sawtooth wave, and I or other folks in the community here could whip off a set for you. What length and file format do you need them to be? Hi folks, another hillbilly idea from the mountains... a telephone dial tone is just about the F note, so that could be a handy reference one day. I didn't know hillbillies had Telephones! Actually, in the US it is a combination of two tones being played together, A 440 and 350 Hz, which is just a teeny bit sharp from an F, in standard tuning. Close enough that nobody would ever be likely to hear the difference, though. Getting your A off the nearest phone is a "sneaky old musician trick", at least in the US. I tried using an electronic tuner and found that there had to be absolute silence in order to get the tone exact. It could even pick up the sound when my furnace came on. IMO. 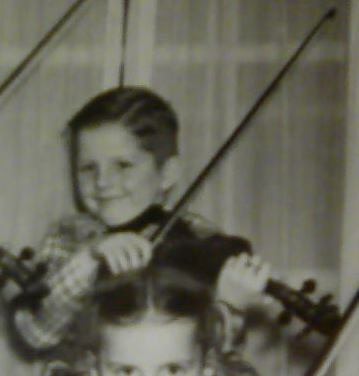 Dennis - Do you mean to say that when you received the viola from Fiddlershop, it was tuned that way. That is incredible that it kept it's intonation on the journey to you. In any case, tuning an instrument is something you need to do often. I tune mine every year. LOL, just kidding, sometimes after every piece. The strings kind of get stretched and pulled and get affected by weather changes as well. I could theoretically get away with not tuning for hours but I want it to be perfect. And I usually check my Tune about every couple hours unless my ear starts to think something is wrong then I check it sooner. I have to say this 600 is mellowing in very nicely already! "Is this something that comes in time?" Not really because its natural to just look at the display on the electronic tuner every time you play a note. This cheating never stops. The way out of the Tuner dependency problem is to place your electronic tuner in front of a webcam and record yourself playing a scale while not looking at the tuner display. While playing each note slowly, say out loud whether its slightly flat or sharp, correct, or a different note altogether. Then go and play back the video to see if you were right. I think you also have to practice becoming interval aware...at least with 4ths, 5ths, and octaves in order to tune the scale properly in the first place. Otherwise you just get stuck in a rut memorizing a sequence of tones and have no understanding of the function and relationship between notes. The flip side of this ear problem is the physical problem of landing the finger accurately each time. The ear knows its wrong, but some notes are always slightly off despite running through the scale a million times. Now I got you. I am sure I know why. I used the same notes from Fiddlerman.com which I probably set for 442 or 443 then I worked on the viola tuner and had to add the C and probably forgot to set it at 440. I'll fix that at the same time as I change the tones to non-vibrato notes.